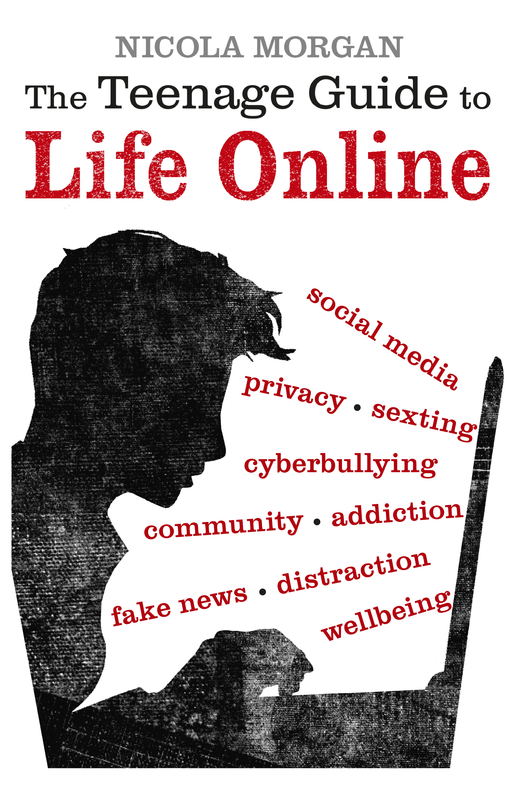 Schools have been focusing for a long time on online safety – by which they mean avoiding danger. That’s very important, of course. But there is much more to talk about and I’m far more interested in the rest: online wellbeing – by which I mean being able to enjoy everything that online has to offer while avoiding all the many risks to best function, mindset, and mental and physical health. Living well online, being able to enjoy it and use it fully, as a tool, rather than it being our tyrant. As it’s Mental Health Awareness month, this seems like the right time to talk about it, although for me every month is about mental health awareness. Throughout the book, every section has “How to avoid these negatives” but at the end I bring it all together with a section on strategies. I want to share some of the strategies here, in different words. And then I have a pledge to suggest, which I’d love you to discuss. This is for all screen-based activity, not only online. My ideas are based on the belief that although there’s no evidence-based definition of “too much”, we can sometimes use our screens in a way that we might notice negatively impacting our physical and mental health. This is at least in part because good health requires us to spend enough time on other things: physical exercise, face-to-face conversation, a variety of activity, and sleep. We don’t need research evidence and stats to tell us this: we notice it ourselves. 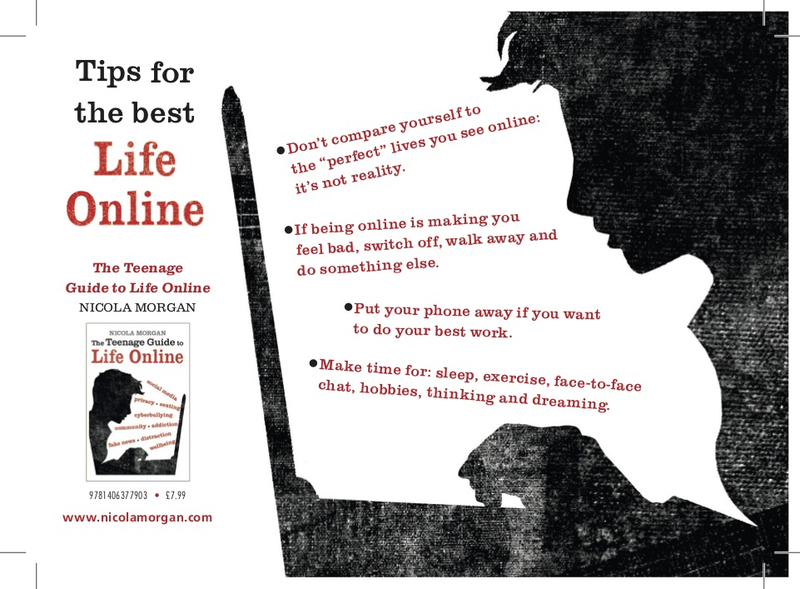 Teenagers are as capable as adults of noticing when something feels exhausting, or stressful, or upsetting, or when they are becoming dependent on tech. Of course, sometimes a person might not be aware of this but I think that once we’re asked to think about it – which is all I ask you to do – we do know when we are over-using. Set a clear deadline for yourself. “I will work for half an hour without using social media” or “I will finish this task on paper, with all my screens switched off” or “I will go for a walk and leave my phone behind”, for example. When you’re doing an important or difficult piece of work or for any reason want to give it your best attention, switch off all screens and devices that you don’t need for it. And switch off any Apps or windows that you don’t need. Minimise all potential distraction.
. This strategy sounds ridiculously simple but it works! It involves having an “instead” action to employ any time you’re tempted to do the thing you’re trying to stop. For example, suppose you keep being tempted to check your phone while you’re working. Make a mental rule for yourself, such as “IF I am tempted to look at my phone, instead I will drink a sip of water.” As I say, sounds silly in its simplicity but try it. Make a pact with your friends – help each other. For example, you might all agree to switch off your phones between certain times – while you revise or do homework, perhaps. It’s so much easier to do something as a team but also it’s easier to avoid social media if you know your friends aren’t there. You might be interested in the Digital Sunset scheme. Agree with your family that you all ALL (parents, too!) put your phones on the landing, switched off, all night. Aim to reduce use gradually, rather than all in one go. No need to go cold turkey! You might try one of the many free Apps that block you from social media for an amount of time you choose. My publishers, Walker Books, and I have created a nice postcard with a different version and I have lots to give away! How can you get some copies of the postcard? Your well-being is in your hands, and that includes your online well-being. The Internet (and everything digital that comes with it) is not a monster – it’s a beautiful giant, but giants can be dangerous or gentle. They need careful handling and that can’t happen without understanding. I am stronger than my smartphone. Oh yes.